Does this make shifting notchier/harder? How does it respond when shifting quickly? Any changes?? Does the clutch still FULLY engage?? 1- No the same as b4 the mod! 3- Yes the clutch STILL fully engages! The G G35 has a hydraulic clutch, and once you get under the dash, all your ?s will be answered when you see how it works! This mod does not cause the clutch to be any more or less engaged!! All it does is lower or raise the pedal from the floor. It is actually changing the fulcrum point if this makes any sense! I did the clutch height adjustment just now. It took all of 5 minutes. Turned the rod a few times counter clockwise until the clutch pedal was just about the height of the brake pedal. Didn't have to adjust the cruise control switch. The feel of the clutch is now enormously better with quicker shifts and less accidental slipping. Clutch now engages about 1 1/2 " above the floor. Thanks very much for the information about this simple mod. if your shift gates were notchy, then it's still the same. After the adjustment, I think it will respond better, since you have shorter clutch pedal travel now, and when you shift, your hand is usually faster than your foot, so this will match up better... less potential grinding.. Anyone that hasn't done this should at least try it. If you don't like it you can undo it but I will guarantee (offer not valid in any state or country) that you will love this. And again, if you don't like it you can just undo it. Took me about 5 mins the first time too but takes me less than a minute now when I want to adjust it. i did this mod a couple of months ago and if you drop the clutch too fast it slips like crazy. the "fulcrum point" thing doesnt make sense, because i was just trying it and was able to make it so low that the clutch was always engaged (very bad). so i think if you lower the engagement point the clutch is some what engaged at all times, killing your clutch life. but thats what happened with me, my clutch used to slip all the time. funny thing is, the nissan tech did this for me the first time and said it was fine. although i do remember it was 10 times better to drive with the lower engagement point, but after soo much clutch slippage, i had to put it back to normal. o yea, and my cruise control stopped working too, another reason i knew something was wrong. it is possible that the 05G35 has something different then the 04's but not sure. i will contact the techs at the inifiniti dealership and check if its bad or not. Very pleased with the adjustment. Had to crank down the limit switch to match the 1mm gap recommended. This means the wires are twisted. Played with the connector until my back gave out but couldn't budge it. 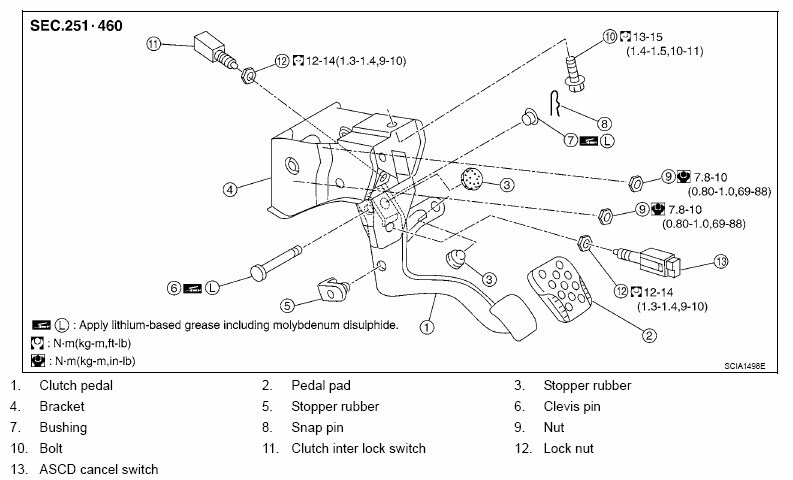 Manual shows several connectors and how to disconnect but none match the ones on the top and bottom of the clutch travel. Any experts out there who could shed some light on how to disconnect? I tried to adjust mine but when I adjust it the cutch becomes very loose. If move it alot, the ASCD cancel switch become permantly disengaged. if it's not fully disengaging it's not your clutch that I would worry about...it's your SYNCHROS! too far up. I've read all the comments on the subject and just would like to clear up one thing. Which way is the rod to be turned? One comment states to turn it clockwise - and another counter-clockwise. Is it to be turned toward me - or away from me, (screwed in toward the firewall, or away from it?) As it is, getting down into the position necessary to perform the task is almost an impossible one. I'm not a large person, but just can't get myself into that tight space. Also, it would be nice to have another arm and hand to use... one for the screwdriver,one for the flashlight - and another one to turn the rod. That rod, by the way is really difficult to turn either way, and since I can barely get my fingers on it, haven't been able to move it a bit. Am I doing something wrong? Greetings to all. 1. Move the driver’s seat back and get in the floor board on your back. 2. Remove the fuse box cover. 3. Locate the clutch pedal assembly. 4. Notice the pedal has a fork attached to it; the fork is connected to a rod that goes back toward the firewall. 5. Insert the tip of the screwdriver into the fork and brace it. 6. Place the 12mm open end wrench on the nut located directly behind the fork, on the rod. 7. Break the nut loose. 8. Grab the rod with your fingers and turn it clockwise. 10. Replace the fuse box cover. I went 4 turns and it ended up perfect, but you may want to start out with 2 turns and see how it feels; you do not want to turn it too many times or the pedal could end up too low to the floor, in which case the clutch would not be disengaged when you fully depress the pedal. If this were the case, the car would begin to move in gear with the clutch depressed, or stall. Gah reading this i cannot wait to do it first thing tm b/c my z that i bought about 2 weeks ago(had an 03 touring auto prior before it was rear ended=totalled R.IP.) has NO free play in the clutch. Push on the pedal resistance after like 3/8ths of an inch...NOOO WONDER my 1st gear starts and 1st-2nd exhanges are jerky unless im extraaa slow. OMG OMG OMG cant wait lol....sorry for the rant but i love these forums when people actually post useful advice and not just flamming noobs for 15 pages! Just did this today. I had a Coppermix Twin plate clutch installed and after 200 break in miles, 1st gear was still unmanageable and unpredictable due to the super high clucth enhagement...I lowered my pedal to be even with the brake pedal and it is so much easier to start from a stop now. Cant believe it how big a difference this makes in driveability. I'm Confussed as to why you are calling this a mod? You not modifying anything from what I read in your OP, unless I missed something. The rod is threaded specifically for adjustment. Anyone that has replaced a clutch has more than likely adjusted it. Is my spoiler warped? whats going on here?